In recent years the events industry has rethought meetings technology, program elements, where and how groups meet to room design. Mirroring these changes is a society which has embraced a new style of creative collaboration among colleagues, active participation in micro-lending for new enterprises and social causes via crowdsourcing, championing the growth in gourmet food trucks as well as flash mobs and pop up events. So, in the continuing quest for event hosts to appeal to a mobile, independently-minded attendee, could the next big innovation not merely be out-of-the-box thinking, but a reinvention of the box? Specifically, considering the potential role of shipping containers as actual pop up venues. Shipping containers are in vogue as a quick, low-cost, study alternative to temporary and permanent facilities. For example, in London, containers have been rehabbed for housing for the homeless. Other places have created pop-up malls and office complexes. A British company, Snoozebox, provides pop-up hotels of up to 200 rooms for events across the UK and Europe. In Canada, permanent container hotels have been built in remote areas to provide instant accommodation for oil patch workers. And the summer of 2016 saw the launch of Area 506, a total pop up event in Saint John, New Brunswick. Area 506 could be the harbinger of a wider trend. Or at least be an adaptable idea for destinations rich in under-utilized land, and weak in large built infrastructure. While the village was the focus, organizers didn’t turn their back on local businesses. They launched a Passport Program with nearby restaurants, shops and venues that encouraged village visitors to collect partner stamps, which were redeemable for rewards at the village. 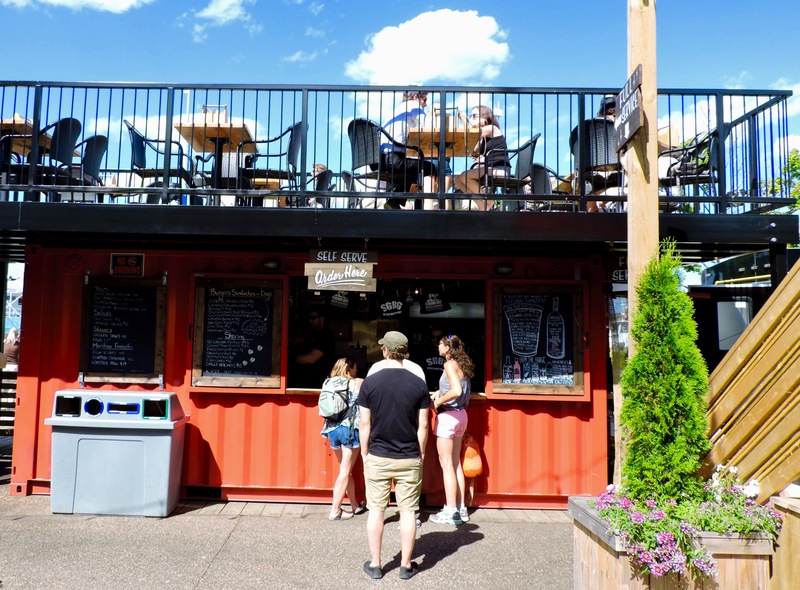 The event utilized food trucks for a food court and borrowed 100 containers from local shipping firms to form, what Destination Saint John executive director Victoria Clark describes as “a steel fortress” which guided pedestrian traffic flow and provided a secure perimeter for the 30,000 people who attended this first-time event (the City of Saint John has a resident population of 65,000). Because these were borrowed containers Clark says, “We didn’t alter these shipping containers in any way. So you could only get in and out of them on one narrow end, but people used them as they saw fit.” A painter and musician used one for a gallery/concert space, while some businesses set up retail shops inside. Matt White of the Sussex Beard Oil Company is one of the out-of-box-in-the-container entrepreneurs who attended. White was just off a successful appearance on Dragon’s Den (the Canadian version of Shark Tank) where his business plan attracted the support of two Dragons. He so quickly bought into the idea he didn’t plan what to do until he was on-site. “I hadn’t thought ahead, as usual. When I got there I opened up my container. I think I got a new container. There was no smell, the walls were fresh paint and I thought this was paradise. So I set my store up inside it. I had a barber with me” and for the two days he sold product and offered haircuts and male makeovers. White already plans a return for 2017. He is such a fan that he is working on a secret project that sounds very much like he could travel the province with his own pop up shop/barbershop. The pop-up event idea is already gaining momentum. In Halifax, Nova Scotia, Eric Stotts, a Boston-trained architect and partner in Skin + Bones Building Design, says, “I can’t disclose who it is, but we’re working with a government agency, planning a big trade show, to develop the model of five containers to be used for a week at a location here in Halifax.” Part of the discussions are on merits of a lease versus ownership scheme for the containers. With the addition of solar panels exhibitors could have a strong, secure, mobile and environmentally friendly trade show booth. A pop-up event village could be a game changer for many groups and destinations.